I love watching Grey Anatomy, Ghost whisperer,Brothers n sisters, Desperate housewife,Heroes (just bcoz my kids love it...which sometimes confused me of the past, present n future..:) Army wives, I watch the Nanny over n over like for 10 yrs till now,friends, American Idol (all seasons), talk shows like Opera winfrey, Ellen D.,Family realty shows like the Kardasian, Kimora model n mom...etc! 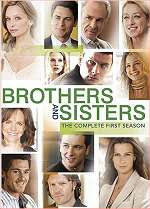 is about a collection of five enmeshed and somewhat damaged adult siblings and their strong but passionately devoted mother, Nora Walker.The Walkers's lives have not been without challenge; romance, parenting, divorce, infidelity, addiction, war and even death have pushed each of them to the limit, but they continue to work toward living their lives as individuals, while loving each other unconditionally and trying to maintain some semblance of normalcy after the loss and lies of their larger-than-life family patriarch, William Walker, the father. 2nd brother Tommy Walker finds himself torn between his loyalty to his family and the desire to make his father's company profitable again, while trying to keep his own marriage alive and provide the emotional support needed by his beautiful wife, Julia and baby daughter, Elizabeth. Kevin is an openly gay lawyer. He'll call his own career into question when he experiences prejudice about his sexuality within the law firm. The Mom, Nora Walker is the matriarch of the family who is strongly doing her best to keep her family together and happy.Despite only knowing that William the husband was stealing company money after he was dead and he also had a mistress, Holly for many many years. ~may we, the mother's be spiritually, mentally and physically strong to keep the family bond stronger......insyaallah! Family is what we made of. Hmm what bout "prison Break" do you like to watch it? its the bonding between two brothers as well..
is Sarah really still alive...? n now 'lipstick jungle'(bout woman,frienship n success)...but if for this i have to use 'kuasa veto' coz my kids watch Heroes.... so malas la!